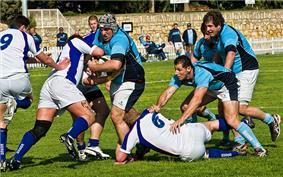 The Slovak national rugby union team represents Slovakia in international rugby union. Slovakia have yet to qualify for a Rugby World Cup. They are currently affiliated to FIRA-AER, but not yet to the IRB. They played their first match in 2006 against Monaco which they lost 0-6. They were however awarded the points, after it was discovered that Monaco had used ineligible players. In 2009 they withdrew from European competition for financial reasons, after being unable to secure sponsorship. However, they returned to European competition in 2010, playing in the 2010–12 European Nations Cup Third Division. In 2015, Rugby Klub Bratislava has settled to provide support for then national team, by providing to the national squad, adults and youths. The new dynamic has been support par the city of Bratislava, and the Government of Slovakia.